(UPDATE 7/9/16: The Penguins have since won the 2016 Stanley Cup and as I write this, Sid Crosby is celebrating – by which I mean working on his Backhand One-Timer or something – with his 2016 Conn Smythe trophy. 1) The point I took 2000 words to make is that it’s freaking irritating as a Hockey Player, particularly one as proud as Sid Crosby, to have someone in the media question your effort and by proxy your integrity as a Hockey Player. Sid is too dignified to respond to criticisms from the media most of the time, so I thought the least I could do was point out what I saw as obvious, which is that Sid was playing injured (broken hand/wrist) on a team with no scoring depth under a coach that has shown little ability to adapt at the NHL level. The results weren’t there, but his effort wasn’t in question. Journalists have a job to do, but I think that in this instance that Dejan either let his emotions get the better or him, or sought to deliberately provoke people rather than report. 2) In retrospect, Dejan’s entire take is hilarious and indicative of the entire fanbase’s mindset at the time. His comments/shots at Sid tapped into the psyche of the Yinzer, in that the Crosby-era Penguins were seeing their tremendous potential squandered under the Shero/Bylsma regime and fans were furious about it. He will tell you otherwise, but I’ve been reading Dejan Kovacevic since 2002, and I know this: he’s a fan. He loves the Penguins in a way that he does not love the Pirates or the Steelers. Dejan was as frustrated as most other Penguins’ fans in Spring 2014 that the team was again sputtering in the early rounds of the playoffs. I incited a minor Twitter war when I made a comment in response to Pittsburgh Tribune-Review/TribLive columnist Dejan Kovacevic’s article, “Embarassed? Not Penguins”. I was less-than-thrilled with a few of the opinions Dejan submitted, and I felt something needed to be said in defense of Sid Crosby in-particular. My view is that the Penguins, like anyone else, are subject to due criticism. But being a huge Penguins’ homer, I view undue criticism of the team, and a few players in particular, very unfavorably. I have no problem with the majority of the article. The Penguins have played inconsistent and often uninspired hockey for most of the 2014 Playoffs. But I take issue with Dejan singling-out Sid Crosby, who in my view is playing through a mid-body or soft-tissue injury, for poor performance. I consider it undue criticism to cite a player for underwhelming play when he’s clearly struggling through an injury. Casual or ignorant fans can easily latch onto the idea that Sid is simply “not trying hard enough”. It’s the classic situation of blaming the best player when a team fails to meet expectations. When a respected columnist such as Dejan suggests that the team’s captain might be giving less than his best, it fuels the wrong kind of fire. Crosby has to be better, even if he’s playing through some kind of injury. He’s out there getting star minutes. He has to be a star. That’s very easy to say or write. Play better, dummy. Dejan admits that Sid is injured, but the tone of his article is that Sid, like the rest of the team, has this untapped reservoir that they aren’t reaching due to lack of desire. That may or may not be true in the case of some players, but in my opinion, Sid is giving absolutely everything he has. My view is that lying on the goal line trying to block a Benoit Pouliot wrister ala Doug Glatt is about as much as a player can reasonably be expected to give. I am not going to pick apart Dejan’s column point-by-point. For the most part, I enjoy his columns and agree with much of his insight. I agree with the overall theme of his most-recent column, which is that the Penguins need to find an emotional charge from somewhere if they hope to advance past the Rangers. But I think it’s poor form when a columnist with Dejan’s access cites Sid’s recent play without throwing up a huge asterisk. Dejan is right in this regard: for the Penguins to get to where they want to be, Sid has to be better. The 2014 Penguins are not a deep team, and Sid is clearly the engine that makes the team go on-ice. The team and the coach all know this. Rolling out a column that suggests the team’s captain is satisfied with his below-standard play is inappropriate, in my view. That’s not Sid’s standard. It’s not even close. Believe me, he knows it. The tack that Dejan took in his column – that Sid could simply turn it up a few notches, and that he was opting to give less than his best in the NHL playoffs – offends me because of the disrespectful subtext: that a dignified hockey player such as Sid Crosby would dog it under any circumstances, particularly these. 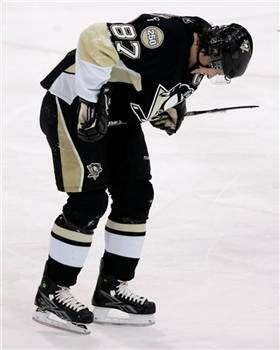 Let’s agree based on recent precedent that Sid is willing to play through pain and injury. Is criticizing him in various local media for not playing better while clearly injured really the most appropriate stance to take? It must be incredibly frustrating to be Sid Crosby and to know that you are playing well-below your personal standard during the most-critical part of the season. But it must be doubly frustrating to have a local writer imply that your mediocre play stems from lack of will. Can the team play better? Certainly. Can the team give more? Maybe or maybe not, at least not without deviating from the game-plan that Dan Bylsma and his staff have constructed. But Sid is out there giving everything his body will allow. I think in this scenario, praise and support would be much more appropriate than swipes at his integrity as a hockey player. Maybe I should have a better sense of humor about this, but questioning an NHL player’s commitment at this time of year, particularly Sid’s, is really offensive to me. Sid Crosby is far too classy to dignify any assaults by the media, so I’ll take the role I usually take against unwiped Flyers and Bruins’ fans and defend his character. He’s playing hurt, and he’s refusing to complain about it. That’s extremely noble. As for getting “Star Minutes”, anyone watching can see that Sid is bailing out early on shifts. As per Eliotte Friedman, Sid’s shift average was down nearly 10 seconds per shift in Game 4 of the Columbus series. He played 19:36 in Game 1 versus the Rangers, and 19:48 in Game 6 against Columbus. Right now his body, for whatever reason, is simply not allowing him to sustain pressure in the Offensive Zone as he has in the past. He’s taking brief swings at the opposition and heading quickly to the bench, because right now, he has to. Sid’s playing 1st-line minutes, yes, but who would you rather give those minutes to in a must-win environment: Sid Crosby at 50%, or some combination of the Penguins’ bottom-six? Dan Bylsma must have thrown up in his mouth when he saw Brandon Sutter hobble off in Game 6 against Columbus. My sudden ally Don Cherry of Hockey Night in Canada also mused that Sid has a back injury of some sort. Based on personal experience, I would have to agree. The only thing worse for a hockey player than debilitating pain in the knee, hand, or hip is when a problem with your back steals your ability to separate from opposing players. If you ever have the chance, ask Mario Lemieux about that. It’s easy to feel sympathetic for an injured player when the injury is highly visible. We all wince when a player takes a puck off the face, and most of us feel pangs of compassion when we see bags of ice or soft casts on a wrist or knee. But when a player has a less-obvious injury – such as a concussion, or as I believe Sid currently has, a moderate spinal injury or sciatic nerve impingement – some people raise eyebrows. It’s as though some people need to see the blood or the bone poking through to take an injured player at his word. I have recently read and heard much more-pointed attacks on Sid than those opined in Dejan’s recent column. But unfortunately, Dejan’s suggestion that Sid has another gear that he’s simply refusing to hit was the straw that broke the camel’s back. The notion that Sid isn’t giving his all offends me as both a hockey player and a Pittsburgh Penguins fan. I am highly biased. I love the Pittsburgh Penguins, and have since I was young. I am prone to defend the Penguins’ superstars, as you can read elsewhere on this blog. I take issue with Dejan’s assessment that Sid is half-assing it. Sid Crosby is one of the most competitive people in sports. Even if Sid were inclined to take shifts off, the Eyeball Test verifies that he has a hitch in his giddy-up. 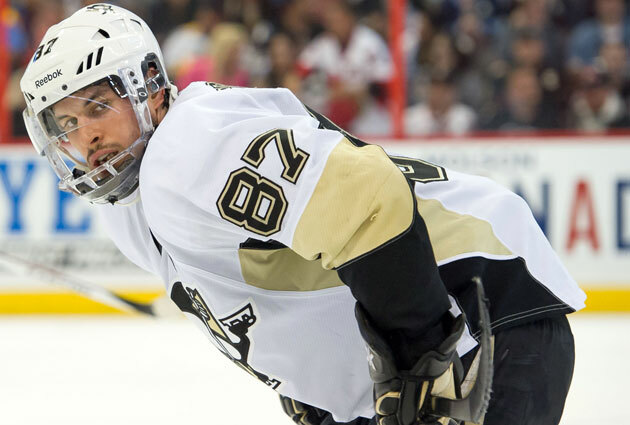 Does Sidney Crosby look like himself? Does he have a reason to suddenly play at half of his ability? Have his many of his raw statistics – Goals, Plus/Minus, Faceoff Win Percentage, Shots – drastically and suddenly fallen off since, oh, I don’t know, April 3rd versus Winnipeg? Sid has thick skin. He’s been picked apart since he was 14. But having a local writer question his level of play while most evidence points to a significant injury is something he shouldn’t have to endure. Since neither the Penguins nor Sid, admirably, will not own up to his injury, I defended him. I am sure it will not be the last time.